Here’s a little secret amongst chefs…we are always looking for something new. I gotta say, new ideas are hard to come by, as there is not too many original ideas. So we take to tweaking, swapping, deconstructing and reconstructing, anything we can do to maintain our hunt to be inventive and creative. Like most chefs I have a pile of food magazines, some cookbooks, and a ton of websites I pour over weekly looking for inspiration. While some people might see this as unoriginal, I believe it’s more of a catalyst to my own work; after all, it’s the hand of the chef that makes the flavors sing. During the weekly voyage thru those piles of magazines and multiple websites, I came across, what I thought was a homerun! It would be perfect for a southern Labor Day cookout. When we entertain at home, we like to have simple, easy and tasty food, along with a few surprises for our guests to enjoy. Watermelon Cocktail Sauce would do just that, refreshing, zippy and quite the “A- ha”. Watermelon Cocktail Sauce Mis en Place- Perfect for end of summer cookouts! The method is pretty simple…put all of the ingredients except the cocktail sauce or ketchup in a food processor and puree. Once all the ingredients are puréed smoothly, transfer into a mixing bowl. The cocktail sauce or ketchup is there to thicken the sauce if necessary. Add a tablespoon at a time and stir well until the sauce is thick enough; this can vary depending how juicy your watermelon is. 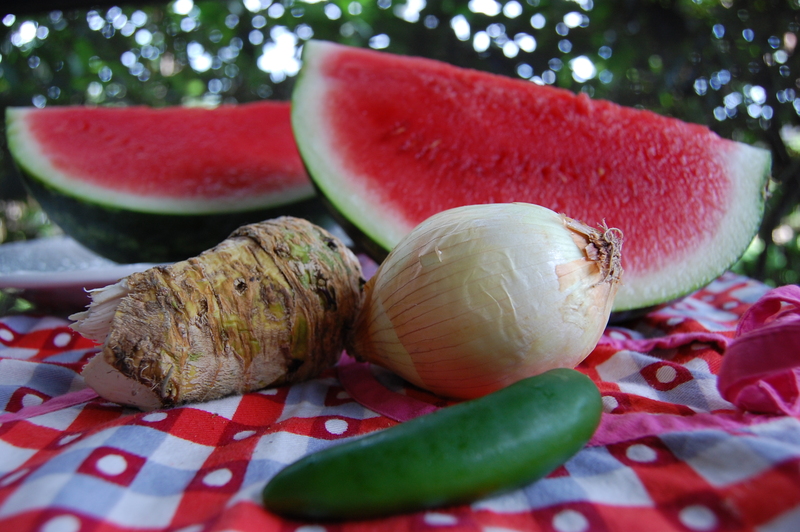 The watermelon cocktail sauce can be made in advance and refrigerated. Fresh Grated Horseradish- peel it like ginger and then grate. 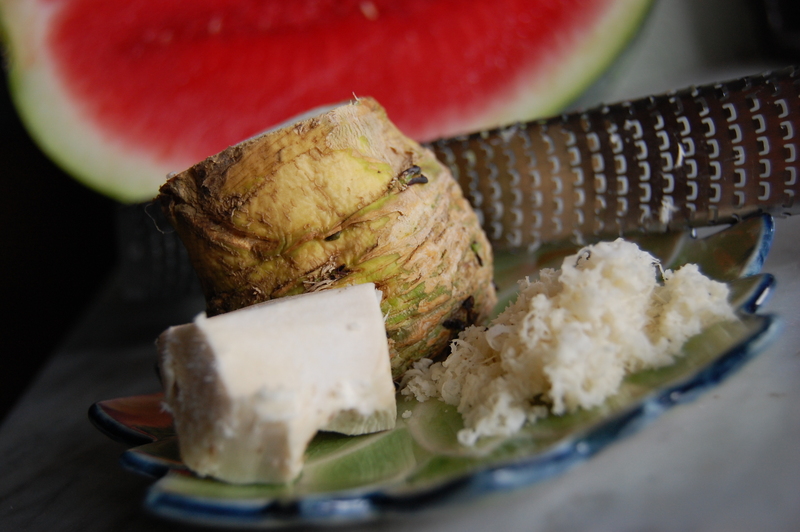 Fresh horseradish is stronger than the prepared type you can buy in the store. Peel the root and grate it; add more or less depending on your taste. 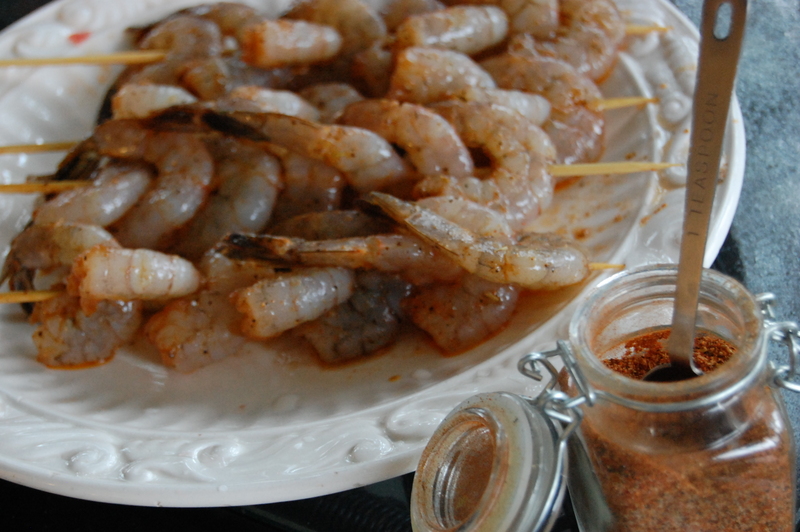 Marinate the shrimp for an hour or so with the olive oil and your favorite creole seasoning before you skewer them. 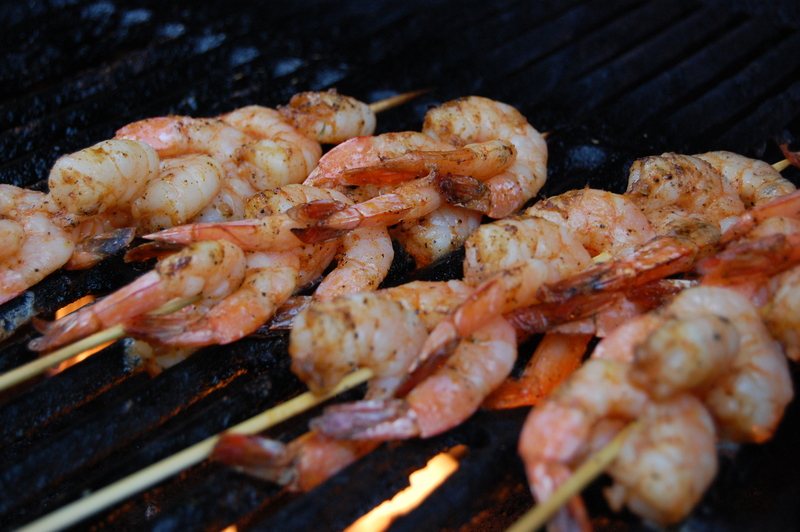 A great tip if you use wood skewers is to soak them in water for a few minutes before you put food on them, this will make sure the skewers don’t burn on the grill. 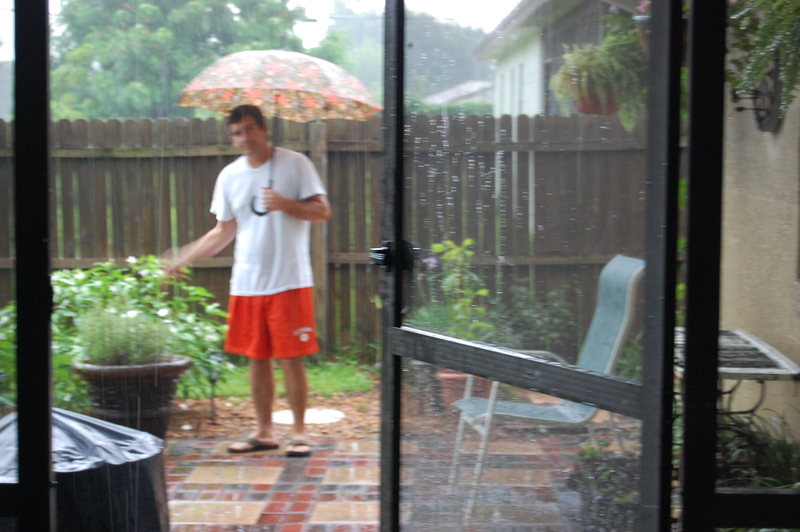 Rain or Shine, Sir Wes is up for anything! 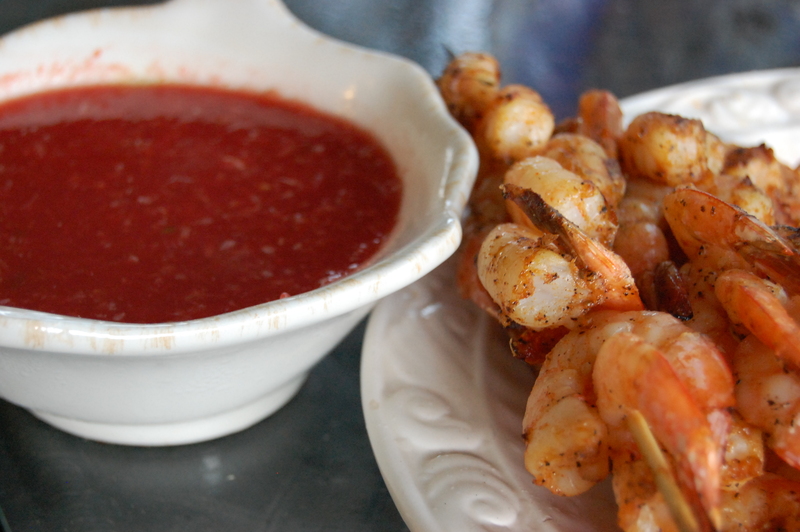 Watermelon Cocktail Sauce with Spicy Creole Grilled Shrimp! Perfect dish to show off your cookng chops! Happy Labor Day to all and may the the rest of the year be just as tasty! Fig Farmer!! While we were in Alabama I became a farmer, yup- I went out in the morning and got myself some food from the yard, brought it into the table and ate. It was awesome, fresh figs from the tree, blueberries from the bushes. 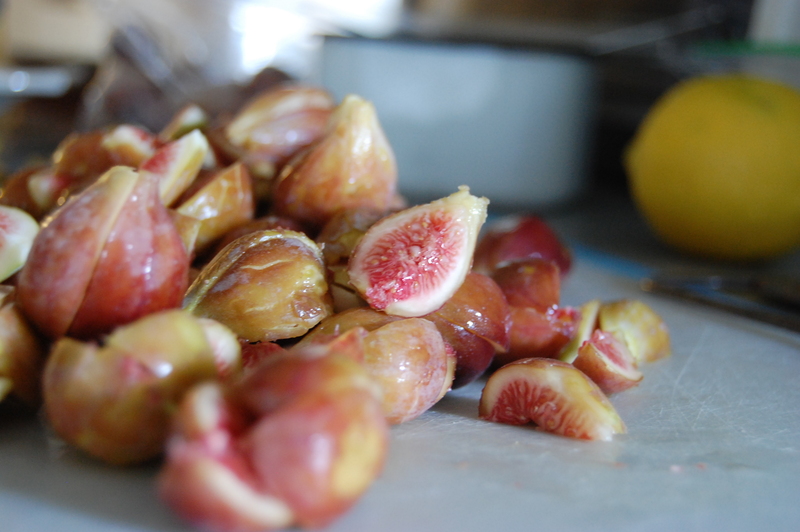 While blueberry cobblers were baking, I sat myself in front of a bowl of Brown Turkey Figs and had a feast. As far as the chores of farming, I have to admit, I did not get a chance to participate, none the less, I did supply some tasty treats! 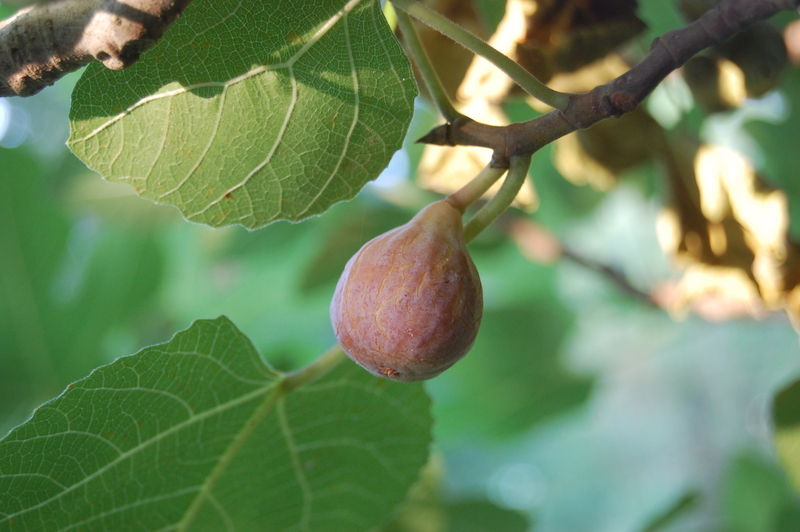 Brown Turkey Fig Tree! Endless Possibilities! Brown Turkey Figs- quartered with the tree stem removed. It’s super easy!! Place all the ingredients in a heavy 2 quart pot and let it simmer slowly. 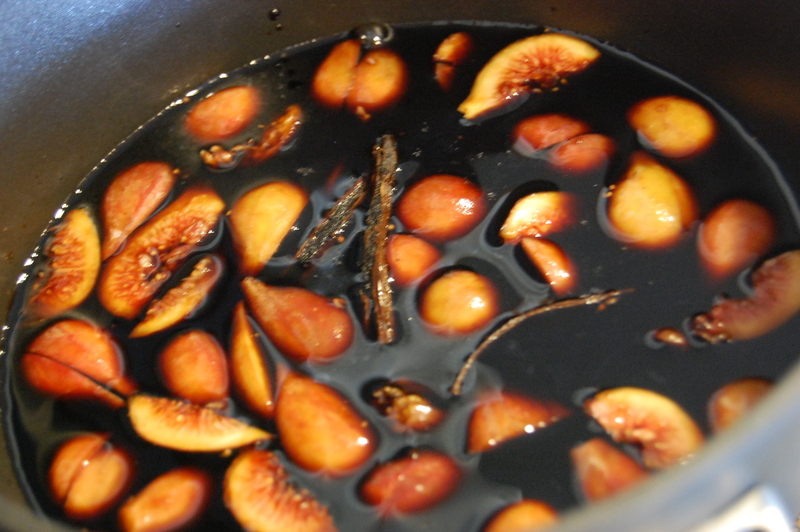 Boiling it too rapidly will result in a burnt flavor, one that cannot be fixed. 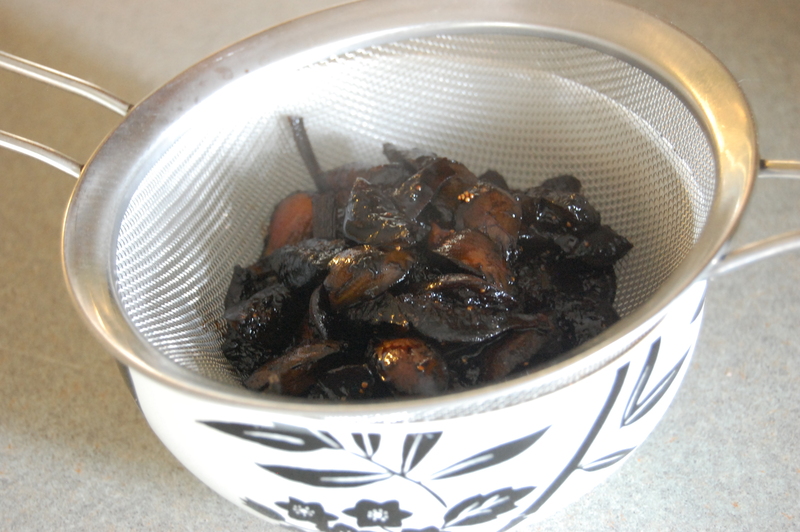 The same burnt flavor will occur if you reduce it too far. When the balsamic vinegar has reduced to about a quarter of what you started with you are in business. Too test if it is thick enough, check to see if it is nappe, which is to “coat the back of a spoon”. 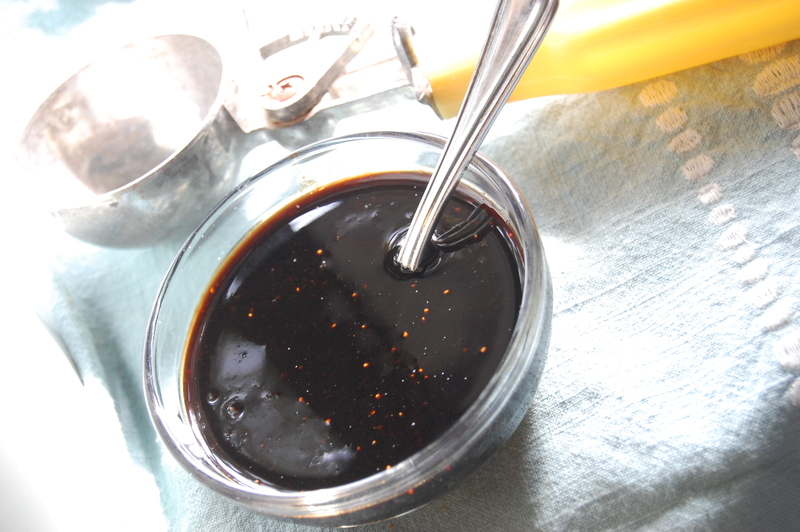 Just dip your spoon into the pot, if most of the glaze fall from the spoon, but the back is still coated ….You’re Winning!!!! 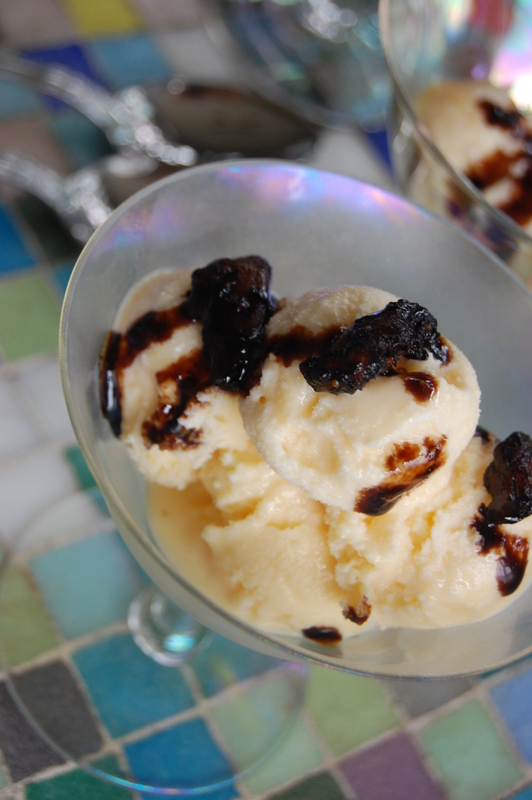 Strain the glaze and allow to cool- I reserved the balsamic figs as sundae toppers. Keep the glaze refrigerated* for up to a year. ** I recommend refrigerating this because of what I added to it- a vinegar reduction with nothing added does not need to be refrigerated. 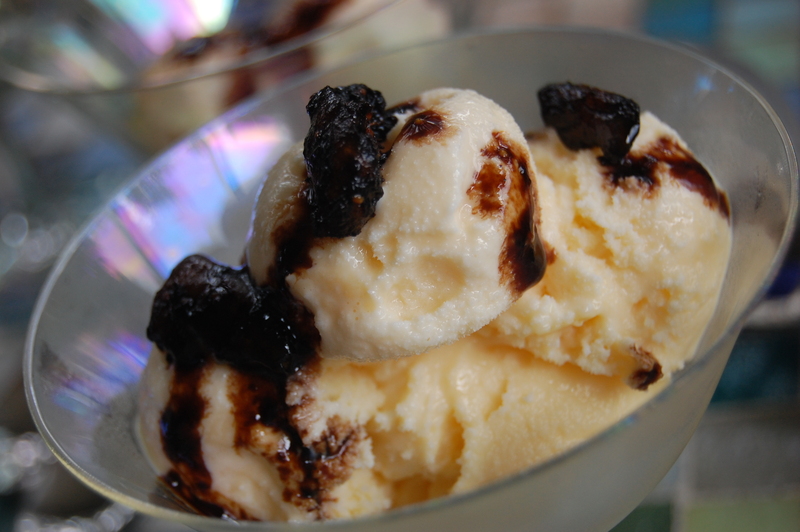 Fig and Vanilla Balsamic Glaze with Vanilla Ice Cream- Move over hot fudge, here something better!!! !